Are you a tea-lover or coffee-lover? You may say “I like both". In that case, why don't you try this unique beverage? Coca-Cola (Japan) Company, Limited has just released unique canned coffee with black tea aroma called "Georgia cross UK-STYLE. The company says that it is a full of flavorful and refreshing aroma coffee with extract of Darjeeling tea known as the Champaign of tea. So, right after you open the can, you will enjoy the tea aroma. Their first unique coffee drinks with Matcha “Georgia cross WA (Japanese) STYLE” was already released last November and caught people’s attention. 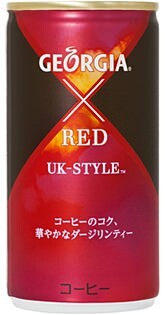 The “UK-STYLE” is the second serious of their novel products mixed with tea. Coffee with Matcha, and with black tea.....then, what's next?? Maybe, with Oriental beauty??? We will see.